Pennsylvania Precision Cast Parts (PPCP) now offers top-quality investment casting utilizing an array of specialized duplex stainless steel alloys to accommodate a wide range of customer requirements, industries and applications. Investment casting customers have increasingly demanding needs and requirements that take specialized alloys to satisfy. 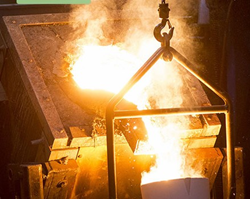 Pennsylvania Precision Cast Parts (PPCP), an industry-leading investment casting company located in Lebanon, Pa., is now offering customers a wide range of duplex stainless steel alloys to meet their specialized needs and specifications. PPCP produces top-quality investment castings for a broad range of parts, industries and applications. PPCP’s duplex stainless steel alloys can provide customers with a variety of benefits from higher strength and less weight to greater corrosion resistance and better price stability. Yet only a small percentage of the market is currently utilizing these high-value alloys for their investment castings. Austenitic steel tends to be non-magnetic and more formable, but with lower strength and less resistance to corrosion cracking. Ferritic grades are magnetic and stronger than austenitic steel, but do not weld as well in thick sections and they lose their toughness at low temperatures. Combining the two grades can produce a new set of characteristics that better suit certain applications. Duplex stainless steel has a variety of elemental components that achieve the desired specifications when combined in carefully determined proportions. Producing exactly the right formula takes skill and experience.